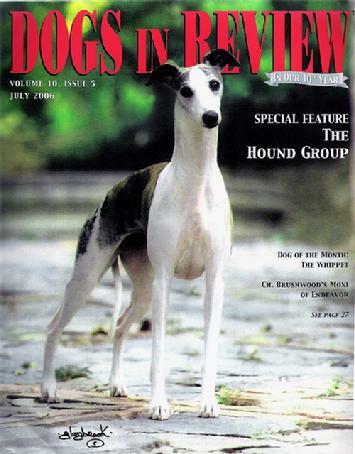 "One of the greatest whippets of all time..."
"She just gets better with time. That evening, I had the pleasure of giving her Best Hound in Show." and moving � and, on top of that, a never-give-in attitude. " Cover Shot (Left) by Gay Glazbrook. Photos Below (L-R) A. Diehl, Gay Glazbrook, Carol Beauchat. Moxi is Unretouched. 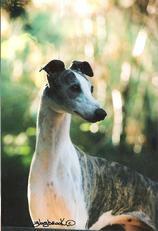 "Moxi," the #1 Whippet in the USA for 2006 and 2007, was the record four-time National Specialty Winner (3 US, 1 Canadian). 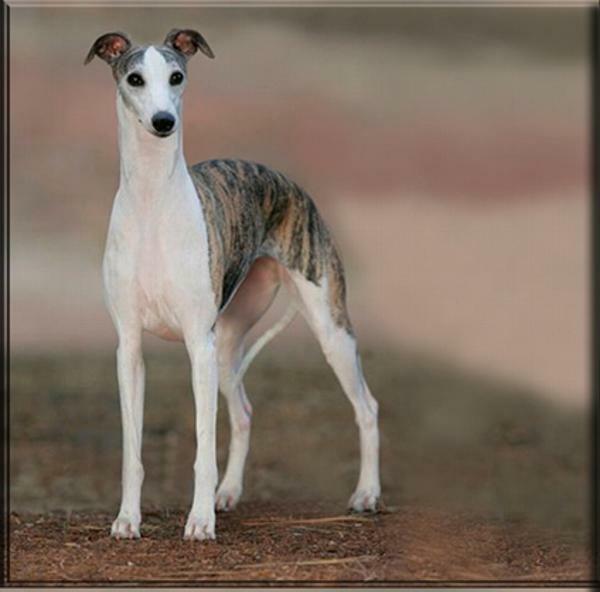 She has been called "one of the greatest whippets of all time" by esteemed breeder judges including Bo Bengtson, Espen Engh, Patsy Gilmour. Moxi's three litters (2005, 2007 & 2009) have produced multi-faceted and accomplished champions, multiple BOB winners, Group Placing and Group-Winning progeny and a Specialty Best in Show daughter, "Epic." Coming out of "retirement" for the 2008 and 2009 AWC Western Specialties, Moxi took SBIS at both, thus retiring the Challenge Trophy, shown by breeder Daniel Lockhart of Saxon Shore, responsible for much of her pedigree. That also took her to a record number of Whippet Specialty Bests and plus a Hound Show Best. Renowned Breeder-Judge Mrs. Harriett Nash Lee awards Moxi her third AWC Western Specialty Best in Show 7.24.09, tying the all-time specialty record of ten, and retiring the two Western Challenge Trophies by winning her third at Lompoc. Moxi is shown by Saxon Shore's Daniel Lockhart. "All the right curves and an expression to die for. " "One of the best the breed has seen in many, many years. " "Absolutely breathtaking... Pure whippet. " Moxi is truly the best of 'all worlds' in whippets; the culmination of select breeding from the very best lines across the globe. After an amazing start as American Whippet Club National Specialty Best in Show from the classes in 2004, we were thrilled to bring Moxi back to her birthplace for her American campaign. Moxi loves to play, runs day and night, and is a whimsical dervish who can make anyone laugh at her antics. But most of all, she's loved and appreciated for her wonderful spirit and temperament. Cover Photo: Gay Glazbrook. Moxi is unretouched. Moxi bred by Dr. Dennis Sumara, Linda Stewart and Raymond Yurick. Owned by Angie Diehl of Nysa Hill. Co-owned by Dr. Dennis Sumara and Linda Stewart. Moxi has been presented in the U.S. by Raymond Yurick, Mandy Clevenger, and Daniel Lockhart of Saxon Shore. 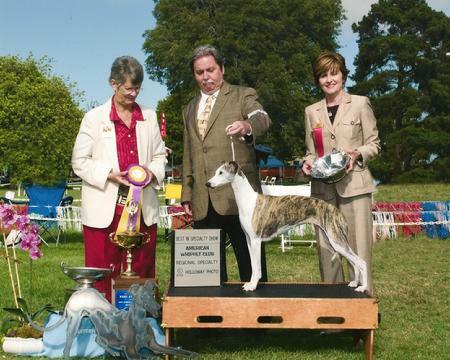 Renowned worldwide whippet breeder-judge and author Bo Bengston (left) honors Moxi with her second National Specialty Best in Show in Boston, 2006.